What is crate training for? Crate training is considered an efficient way to house train a puppy. Since most dogs will not eliminate in the same place they sleep, your dog will most likely try to hold it when it is confined to its crate. Crate training can also help prevent and fix a lot of unwanted behaviour problems, such as chewing on furniture, fear of strangers, separation anxiety, and others. If you happen to have visitors who do not favour dogs, crate training is also very effective. A lot of people are not sure whether it's cruel or not to crate a dog or a puppy. Most dog trainers are sure that leaving a dog in a crate isn't more cruel than leaving a baby in a playpen or crib. Crates let dog owners have the peace of mind knowing their dog is safe when they cannot supervise it. Additionally, crates let dogs have their own safe and secure 'den'. Crating a dog is more natural than it seems to be at first glance, because domestic dog ancestors - wild dogs and wolves - have always looked for a hole to comfortably sleep in. There are several types of crates to choose from, such as a wire cage, a plastic carrier, a soft-sided canvas, and a nylon crate. You can come across wood dog crates as well. Wire crates have a few features that make them very popular, one of them being an extra panel (divider) which allows you to make the crate bigger or smaller depending on your dog's size. This is perfect if you crate train a growing puppy. Should you need such a divider, make sure you check its availability before you purchase a crate because some wire crates don't have it. Wire crates are also chewing proof, collapsible, easy to clean, and they allow the dog to see what's going on around. Some people, however, prefer to use a cover to darken the inside of the dog crate for more security. A plastic pet carrier is a nice option for those who need to travel. The downside of this type of crates is that it doesn't let in as much light as a wire crate. It is also a little harder to clean. 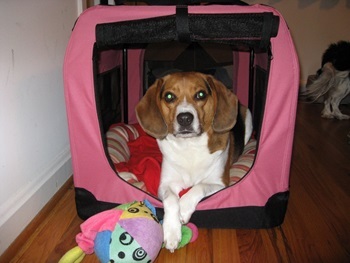 A soft-sided crate can be a good option for dogs that don't have a habit to chew on things. They weigh very little so they are easy to carry along when you are travelling with your dog. However, if the dog begins to chew or scratch at the sides, it will be able to break out. This type of crates is not recommended for young puppies. A dog crate should be large enough to allow your dog to stretch out and sit up comfortably without being restrained. The crate, nonetheless, shouldn't be too large because that would defy the main ideas of crate training: providing security and building bladder (bowel) control. If the crate is too spacious, the dog may be tempted to use one crate area to sleep and another spot to eliminate. A crate should be placed out of direct sunlight and cold draught, in the room where you and your family spend most of the time. Dogs are pack animals, so they will surely enjoy your presence. Corners of rooms are usually a good choice. When and how do I start crate training? It is never late to start crate training, whether you have a young or older dog. With puppies, of course, the entire process will be easier and take less time. After you've bought a crate and found a good place for it, arm yourself with patience and follow the steps described below. 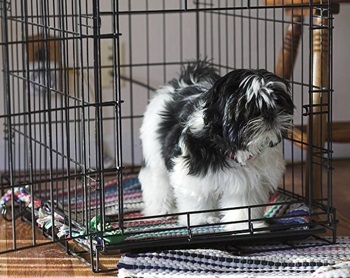 Start by letting your dog explore the crate at its own pace without forcing it to go inside. Leave the crate door open, place your dog's favourite toys or treats inside just behind the door, so the dog needs to enter the crate to retrieve it. Consider placing something soft on the bottom of the crate so entering it feels more comfortable. Day by day, move the treats or toys further back in the crate. It usually takes a few days before the dog begins to walk in and out of the crate without hesitation. When it happens, you can move on to step two. When your dog is inside the crate, quietly close the door and leave it closed for a few minutes. If your dog got nervous or began to cry, wait till it calms down. The door should be opened only when your pet is quiet. Praise profusely and release it from the crate. Gradually increase the amount of time the dog is locked inside. The goal is to train your dog to be closed in the crate while you are in the room. When you dog remains quiet for long periods of time or/and easily falls asleep in a closed crate, the goal is achieved, and you can move on to the next stage. Once your dog feels comfortable in a closed crate, leave the room and return when you do not hear any barking or crying. Reward the dog and let it out. Keep repeating the entire process, leaving your dog alone for longer periods of time as you proceed. You can start with 1 to 5 mins and gradually make it 30 mins and more. 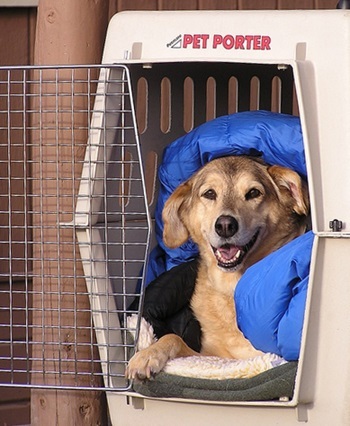 Crate your dog at regular intervals during the day up to a maximum of 1-2 hours. Note: It's important that you don't end up crating your dog only when you leave the house. You should keep crating it when you are home, too. This will teach the dog crating is not a big deal, and that you never leave forever. It's especially helpful when you deal with separation anxiety. 1) It is extremely important to return and let your dog out only when there is no sign of barking or whining. The dog should be completely calm before you come back and release it. Opening the crate or returning while the dog is barking or whining will simply teach it that, if it makes enough noise, it will be let out. This is a mistake that should never be done to save you from many sleepless nights as you wait for your puppy to settle down. 2) Never use your dog's crate as a punishment. The crate is a place of safety and security. It should never be associated with negative experience. 3) Don't crate your dog for over 2-3 hours. Puppies are physically not able to hold their bladder and bowels for longer than that. An adult dog who has never been house trained shouldn't be left for longer than 2-3 hours, either. Older dogs may be able to hold it longer. Dogs should never be left crated for more than 3-4 hours without being taken out for exercise, playtime, and time to cuddle with you. What if my dog soils the crate? Most dogs and puppies will not eliminate in the same place they sleep, but you should be sure to walk your puppy outside every 1-2 hours. Even if you do this, be ready for accidents, especially at night. Take your dog out before bedtime to minimize the risk. If you hear whining at night, get up and take the dog out. Additionally, take it out after feeding time, waking up, play sessions, and whenever you see it sniff the floor. When you take the dog to the elimination spot (in the house or outside), say "Go pee." Dogs do understand, and they will learn to pee on command. Praise the dog after it eliminates. Then take the dog back in and play with it, or play with it outside, or take it for a walk (after third set of shots). Do not punish the dog if it soils the crate. Clean accidents as soon as possible with a specialised odour removing cleaner. Do not use ammonia-based cleaners. They have a smell very similar to urine, which can provoke more soiling. Arm yourself with a couple of machine washable beds, and keep changing them when necessary. What do I do with the crate after my dog is housebroken? Housebreaking can take up to 12 months, and you won't need to keep on crating once your dog becomes trustworthy. You may opt to remove the crate, but many dogs keep enjoying it as their own special spot, so why not leave it?